The space shuttle Discovery launched on its STS-31 mission on April 24, 1990 at 8:33 a.m. EDT. 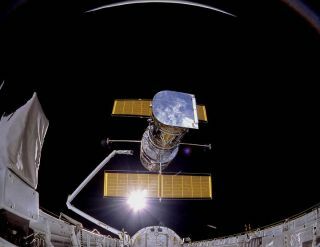 The mission featured the deployment of the Hubble Space Telescope, the first of NASA's Great Observatories to reach orbit. STS-66 further advanced comprehensive effort to collect data about sun's energy output, chemical makeup of the Earth's middle atmosphere, and how these factors affect global ozone levels. Seven instruments on the Atmospheric Laboratory for Applications and Science-3 (ATLAS-3) also flew on first two ATLAS flights. No other collection of space-based instruments provides same extensive range of atmospheric measurements. Also considered a primary payload was the Cryogenic Infrared Spectrometers and Telescopes for the Atmosphere-Shuttle Pallet Satellite (CRISTA-SPAS), continuing joint NASA-German Space Agency (DARA) series of scientific missions. ATLAS-3 and CRISTA-SPAS considered as joint mission with single set of science objectives. During mission, crew divided into two teams for around-the-clock research. Crew consisted of Commander Donald R. McMonagle, Pilot Curtis L. Brown Jr., Payload Commander Ellen Ochoa, Mission Specialists Scott E. Parazynski, Joseph R. Tanner and Jean-Francois Clervoy. Mission also took advantage of opportunity to study fires set in British Columbia, Canada, for forest management purposes. Special readings were taken with another SRL element, Measurement of Air Pollution from satellites (MAPS), to gain better understanding of carbon monoxide emissions from burning forest. Flying for fourth time on the shuttle, MAPS is designed to measure global distribution of carbon monoxide. Crew consisted of Commander Michael A. Baker, Pilot Terrence W. Wilcutt, Payload Commander Thomas D. Jones, Mission Specialists Steven L. Smith, Daniel W. Bursch and Peter J. K. Wisoff. STS-64 marked first flight of Lidar In-space Technology Experiment (LITE) and first untethered U.S. extravehicular activity (EVA) in 10 years. LITE payload employs lidar, which stands for light detection and ranging, a type of optical radar using laser pulses instead of radio waves to study Earth's atmosphere. First spaceflight of lidar was highly successful technology test. LITE instrument operated for 53 hours, yielding more than 43 hours of high-rate data. Unprecedented views were obtained of cloud structures, storm systems, dust clouds, pollutants, forest burning and surface reflectance. Sites studied included atmosphere above northern Europe, Indonesia and the south Pacific, Russia and Africa. Sixty-five groups from 20 countries are making validation measurements with ground-based and aircraft instruments to verify LITE data. LITE science program is part of NASA's Mission to Planet Earth. Mission Specialists Lee and Meade completed the 28th EVA of the Space Shuttle Program on Sept. 16. During six-hour, 15-minute EVA, they tested new backpack called Simplified Aid for EVA Rescue (SAFER), designed for use in event crew member becomes untethered while conducting an EVA. Crew consisted of Commander Richard N. Richards, Pilot L. Blaine Hammond Jr., Mission Specialists Jerry M. Linenger, Susan J. Helms, Carl J. Meade and Mark C. Lee. Payload Specialist Chiaki Mukai became the first Japanese woman to fly in space; she also set the record for the longest flight to date by a female astronaut. STS-65 marked second flight of International Microgravity Laboratory (IML-2), carrying more than twice the number of experiments and facilities as IML-1. Crew split into two teams to perform around-the-clock research. More than 80 experiments, representing more than 200 scientists from six space agencies, were located in Spacelab module in payload bay (one piece of equipment stowed in middeck lockers). Fifty of the experiments delved into life sciences, including bioprocessing, space biology, human physiology and radiation biology. Some of the equipment used for these investigations had flown on previous Spacelab flights, such as European Space Agency's Biorack, making its third flight. IML-2 Biorack housed 19 experiments featuring chemicals and biological samples such as bacteria, mammalian and human cells, isolated tissues and eggs, sea urchin larvae, fruit flies and plant seedlings. Over the course of a single mission, specimens can evolve through several stages of life cycles, allowing study of effects of microgravity and cosmic radiation on living tissues. The flight marked the first time liftoff and reentry as experienced from the crew cabin were captured on videotape. Crew took time during mission to honor 25th anniversary of Apollo 11, noting it also featured a spacecraft named Columbia. Commander Robert D. Cabana, Pilot James D. Halsell Jr., Payload Commander Richard J. Hieb and Mission Specialists Carl E. Walz, Leroy Chiao and Donald A. Thomas and Payload Specialist Chiaki Naito-Mukai. Primary payload was the Space Radar Laboratory (SRL-1), located in payload bay; activated by crew and operated by teams on ground. SRL-1 included the Spaceborne Imaging Radar-C and the X-band Synthetic Aperture Radar (SIR-C/X-SAR) and an atmospheric instrument called Measurement of Air Pollution from Satellites (MAPS). The German Space Agency (DARA) and the Italian Space Agency (ASI) provided the X-SAR instrument. SIR-C/X-SAR covered approximately 38.5 million miles of the Earth, the equivalent of 20 percent of the planet. More than 400 sites were imaged, including 19 primary observation sites (supersites) in Brazil, Michigan, North Carolina and Central Europe. Thirteen countries were represented in the project with 49 principal investigators and more than 100 scientists, coordinated by the Jet Propulsion Laboratory (JPL). Some 133 hours of data were collected. The MAPS experiment measured the global distribution of carbon monoxide in the troposphere, or lower atmosphere. Mission also marked first flight of Toughened Uni-Piece Fibrous Insulation, known as TUFI, an improved thermal protection tile. Several test tiles were placed on orbiter's base heat shield between three main engines. Crew consisted of Commander Sidney M. Gutierrez, Pilot Kevin P. Chilton, Payload Commander Linda M. Godwin and Mission Specialists Jay Apt, Michael R. Clifford and Thomas D. Jones. Primary payloads were U.S. Microgravity Payload-2 (USMP- 2) and Office of Aeronautics and Space Technology-2 (OAST- 2). USMP-2 included five experiments investigating materials processing and crystal growth in microgravity, while OAST-2 featured six experiments focusing on space technology and spaceflight. Both payloads were located in the payload bay, activated by crew and operated by teams on the ground. USMP-2 experiments received emphasis at beginning of flight; later in mission Columbia's orbit lowered about 20 nautical miles to facilitate OAST-2 experiments. Crew consisted of Commander John H. Casper, Pilot Andrew M. Allen and Mission Specialists Pierre J. Thuot, Charles D. Gemar and Marsha S. Ivins. First shuttle flight of 1994 marked the first flight of Russian cosmonaut on U.S. space shuttle as first element in implementing Agreement on NASA/Russian Space Agency Cooperation in Human Space Flight. Mission also marked second flight of SPACEHAB pressurized module and 100th Get Away Special payload to fly in space. Also on board was Wake Shield Facility-1 (WSF-1), making first in a planned series of flights. SPACEHAB-2 activated shortly after reaching orbit. Taking up about one quarter of payload bay, the 1,100 cubic foot (31 cu.m.) module carried 12 experiments. Four of these involved materials science topics, seven life sciences investigations, and a space dust collection experiment. On flight day three, crew made first attempt to deploy WSF-1 using remote manipulator system arm. WSF-1 is deployable/retrievable experiment platform designed to leave a vacuum wake in low earth orbit that is 10,000 times greater than achievable on Earth. In this ultra-vacuum environment, defect-free thin-film layers of gallium arsenide and other semiconductor materials can be grown. First deploy attempt waved off due to radio interference and difficulty reading status signs on WSF-1. After second deploy attempt on flight day four waved off due to problems with WSF-1 attitude control system, five out of seven planned films grown with WSF-1 platform suspended at end of RMS arm. WSF-1 berthed in cargo bay on flight day six. Crew consisted of Commander Charles F. Bolden Jr., Pilot Kenneth F. Reightler Jr. and Mission Specialists N. Jan Davis, Ronald M. Sega, Franklin R. Chang-Diaz and Sergei K. Krikalev. Crew consisted of Commander Richard O. Covey, Pilot Kenneth D. Bowersox, Payload Commander F. Story Musgrave and Mission Specialists Kathryn C. Thornton, Claude Nicollier, Jeffrey A. Hoffman and Tom Akers. President Clinton and Vice President Gore congratulated crew, and Swiss minister of internal affairs called the following day to congratulate Nicollier. Second dedicated Spacelab Life Sciences mission (SLS- 2). Fourteen experiments conducted in four areas: regulatory physiology, cardiovascular/cardiopulmonary, musculoskeletal and neuroscience. Eight of the experiments focused on crew; six on 48 rodents. Crew collected more than 650 different samples from themselves and rodents, increasing statistical base for life sciences research. Combined data from SLS-1 and SLS-2 will help build comprehensive picture of how humans and animals adapt to weightlessness. Six rodents were killed and dissected during mission, yielding first tissue samples collected in space and not altered by re-exposure to Earth's gravity. Crew consisted of Commander John E. Blaha, Pilot Richard A. Searfoss, Mission Specialists M. Rhea Seddon, William S. McArthur, Jr., David A. Wolf, Shannon W. Lucid and Payload Specialist Martin Fettman. One of two primary payloads, Advanced Communications Technology Satellite (ACTS), deployed on flight day one. About 45 minutes after ACTS deploy, attached Transfer Orbit Stage (TOS) booster — flying on the shuttle for the first time — fired to propel pioneering communications technology spacecraft to geosynchronous transfer orbit. Crew consisted of Commander Frank L. Culbertson Jr., Pilot William F. Readdy Mission Specialists James H. Newman, Daniel W. Bursch and Carl E. Walz. Crew consisted of Commander Ronald J. Grabe, Pilot Brian Duffy, Payload Commander G. David Low and Mission Specialists Nancy J. Sherlock, Peter J. Wisoff and Janice E. Voss. D-2 became the second Spacelab flight under German mission management; around-the-clock operations performed by crew, divided into two teams. Some 88 experiments were conducted, covering materials and life sciences, technology applications, Earth observations, astronomy and atmospheric physics. Material science investigations were: Material Science Experiment Double Rack for Experiment Modules and Apparatus (MEDEA); Werkstofflabor (WL); Holographic Optics Laboratory (HOLOP); and on Unique Support Structure (USS) located aft of D-2 in cargo bay, Material Science Autonomous Payload (MAUS), and Atomic Oxygen Exposure Tray (AOET). Also located on USS, Radiation Detectors (RD) experiments. One crystal growth experiment yielded 0.78-inch (20-mm) crystal of gallium arsenide, largest produced in space to date. Crew consisted of Commander Steven R. Nagel, Pilot Terence T. Henricks, Mission Specialists Jerry L. Ross, Charles J. Precourt, Bernard A. Harris, Jr. and Payload Specialists Ulrich Walter and Hans Schlegel. The primary payload of the flight was the Atmospheric Laboratory for Applications and Science-2 (ATLAS-2), designed to collect data on relationship between sun's energy output and Earth's middle atmosphere and how these factors affect ozone layer. Included six instruments mounted on Spacelab pallet in cargo bay, with seventh mounted on wall of bay in two Get Away Special canisters. Atmospheric instruments were Atmospheric Trace Molecule Spectroscopy (ATMOS) experiment; Millimeter Wave Atmospheric Sounder (MAS); and Shuttle Solar Backscatter Ultraviolet/A (SSBUV/A) spectrometer (on cargo bay wall). Solar science instruments were Solar Spectrum Measurement (SOLSPEC) instrument; Solar Ultraviolet Irradiance Monitor (SUSIM); and Active Cavity Radiometer (ACR) and Solar Constant (SOLCON) experiments. Crew consisted of Commander Kenneth D. Cameron, Pilot Stephen S. Oswald, Mission Specialists C. Michael Foale, Kenneth D. Cockrell and Ellen Ochoa. Crew consisted of Commander John H. Casper, Pilot Donald R. McMonagle, Mission Specialists Mario Runco, Jr., Gregory J. Harbaugh and Susan J. Helms. Crew consisted of Commander David M. Walker, Pilot Robert D. Cabana, Mission Specialists Guion S. Bluford, Jr., James S. Voss and Michael R. Clifford. Crew consisted of Commander James D. Wetherbee, Pilot Michael A. Baker, Mission Specialists Charles L. Veach, William M. Shepherd, Tamara E. Jernigan and Payload Specialist Steven A. MacLean. Spacelab-J — a joint NASA and National Space Development Agency of Japan (NASDA) mission utilizing a manned Spacelab module — conducted microgravity investigations in materials and life sciences. The international crew, consisting of the first Japanese astronaut to fly aboard the shuttle (Mohri), the first African-American woman to fly in space (Jemison) and the first married couple to fly on the same space mission (Davis & Lee), was divided into red and blue teams for around the clock operations. Spacelab-J included 24 materials science and 20 life sciences experiments, of which 35 were sponsored by NASDA, 7 by NASA and two collaborative efforts. Crew consisted of Commander Robert L. Gibson, Pilot Curtis L. Brown Jr., Mission Specialists Mark C. Lee, N. Jan Davis, Jay Apt, Mae C. Jemison and Payload Specialist Mamoru Mohri. The primary objective was deployment of the European Space Agency's European Retrievable Carrier (EURECA) and operation of the joint NASA/Italian Space Agency Tethered Satellite System (TSS). The mission was extended one day to complete the science objectives. EURECA deployed one day later than scheduled because of problem with its data handling system. After deployment, the spacecraft's thrusters were fired to boost EURECA to its planned operating altitude of about 310 statute miles (499 kilometers). However, the thruster firing was cut to six minutes instead of the planned 24 minutes because of unexpected attitude data from EURECA. The problem resolved and EURECA was boosted to operational orbit on the sixth day of the mission. The payload was to be retrieved on STS-57 in 1993. TSS deployment was also delayed one day because of EURECA. During TSS deployment, the satellite reached a maximum distance of only 840 feet (256 meters) from orbiter instead of planned 12.5 miles (20 kilometers) because of a jammed tether line. After numerous attempts over several days to free the tether, TSS operations were curtailed and satellite was stowed for return to Earth. Crew consisted of Commander Loren J. Shriver, Pilot Andrew M. Allen, Mission Specialists Jeffrey A. Hoffman, Franklin R. Chang-Diaz, Claude Nicollier, Marsha S. Ivins and Payload Specialist Franco Malerba. The primary payload was the United States Microgravity Laboratory-I (USML-1), a manned Spacelab module with a connecting tunnel to the orbiter crew compartment. USML-1 was a national effort to advance microgravity research in a broad number of disciplines. The 13 day mission, the first Extended Duration Orbiter flight and the longest space shuttle mission to date, also provided new information on the effects of long-term human stay in space. Experiments conducted were: Crystal Growth Furnace (CGF), Drop Physics Module (DPM), Surface Tension Driven Convection Experiment (STDCE), Zeolite Crystal Growth (ZCG), Protein Crystal Growth (PCG), Glovebox Facility (GBX), Space Acceleration Measurement System (SAMS), Generic Bioprocessing Apparatus (GBA), Astroculture-1 (ASC), Extended Duration Orbiter Medical Project (EDOMP), and Solid Surface Combustion Experiment (SSCE). Crew consisted of Commander Richard N. Richards, Pilot Kenneth D. Bowersox, Mission Specialists Bonnie J. Dunbar, Ellen S. Baker, Carl J. Meade and Payload Specialists Lawrence J. DeLucas and Eugene H. Trinh. The INTELSAT VI (F-3) satellite, stranded in an unusable orbit since its launch aboard a Titan vehicle in March 1990, was captured by crewmembers during an EVA (extravehicular activity) and equipped with a new perigee kick motor. The satellite was subsequently released into orbit and the new motor fired to put the spacecraft into a geosynchronous orbit for operational use. The capture required three EVAs: a planned one by astronaut Pierre J. Thuot and Richard J. Hieb who were unable to attach a capture bar to the satellite from a position on the RMS; a second unscheduled but identical attempt the following day; and finally an unscheduled but successful hand capture by Pierre J. Thuot and fellow crewmen Richard J. Hieb and Thomas D. Akers as Commander Daniel C. Brandenstein delicately maneuvered the orbiter to within a few feet of the 4.5 ton communications satellite. An ASEM structure was erected in the cargo bay by the crew to serve as a platform to aid in the hand capture and subsequent attachment of the capture bar. First EVA involving three astronauts. First and second longest EVA to date: 8 hours and 29 minutes and 7 hours and 45 minutes. First shuttle mission to feature four EVAs. EVA time for a single shuttle mission: 25 hours and 27 minutes, or 59:23 person hours. First shuttle mission requiring three rendezvous with an orbiting spacecraft. First attachment of a live rocket motor to an orbiting satellite. First use of a-drag chute during a shuttle landing. Crew consisted of Commander Daniel C. Brandenstein, Pilot Kevin P. Chilton, Mission Specialists Pierre J. Thuot, Kathryn C. Thornton, Richard J. Hieb, Thomas D. Akers and Bruce E. Melnick. The mission carried the first Atmospheric Laboratory for Applications and Science (ATLAS-1) on Spacelab pallets mounted in the orbiter's cargo bay. The non-deployable payload, equipped with 12 instruments from the U.S., France, Germany, Belgium, Switzerland, the Netherlands and Japan, conducted studies in atmospheric chemistry, solar radiation, space plasma physics and ultraviolet astronomy. ATLAS-1 instruments were: Atmospheric Trace Molecule Spectroscopy (ATMOS); Grille Spectrometer; Millimeter Wave Atmospheric Sounder (MAS); Imaging Spectrometric Observatory (ISO); Atmospheric Lyman-Alpha Emissions (ALAE); Atmospheric Emissions Photometric Imager (AEPI); Space Experiments with Particle Accelerators (SEPAC); Active Cavity Radiometer (ACR); Measurement of Solar Constant (SOLCON); Solar Spectrum (SOLSPEC); Solar Ultraviolet Spectral Irradiance Monitor (SUSIM); and Far Ultraviolet Space Telescope (FAUST). Commander Charles F. Bolden Jr., Pilot Brian Duffy, Mission Specialists Kathryn D. Sullivan, David C. Leestma, C. Michael Foale and Payload Specialists Byron K. Lichtenberg and Dirk D. Frimout. The primary payload was the International Microgravity Laboratory-1 (IML-1), making its first flight and using the pressurized Spacelab module. The International crew was divided into two teams for around-the-clock research on the human nervous system's adaptation to low gravity and the effects of microgravity on other life forms such as shrimp eggs, lentil seedlings, fruit fly eggs, and bacteria. Materials processing experiments were also conducted, including crystal growth from variety of substances such as enzymes, mercury iodide and a virus. On flight day six, mission managers concluded enough onboard consumables remained to extend the mission one day to continue science experiments. Secondary payloads were: 12 Get Away Special (GAS) canisters attached to a GAS Bridge Assembly in the cargo bay and containing a variety of U.S. and international experiments. Crew consisted of Commander Ronald J. Grabe, Pilot Stephen S. Oswald, Mission Specialists Norman E. Thagard, David C. Hilmers, William F. Readdy and Payload Specialists Roberta L. Bondar and Ulf D. Merbold. A dedicated Department of Defense mission. The unclassified payload included a Defense Support Program (DSP) satellite and attached Inertial Upper Stage (IUS), which were deployed on flight day one. Cargo bay and middeck payloads: Interim Operational Contamination Monitor (IOCM); Terra Scout; Military Man in Space (M88-1); Air Force Maui Optical System (AMOS); Cosmic Radiation Effects and Activation Monitor (CREAM); Shuttle Activation Monitor (SAM); Radiation Monitoring Equipment III (RME III); Visual Function Tester-1 (VFT-1); Ultraviolet Plume Instrument (UVPI). Bioreactor Flow and Particle Trajectory experiment; and Extended Duration Orbiter Medical Project, a series of investigations in support of Extended Duration Orbiter. Crew consisted of Commander Frederick D. Gregory, Pilot Terence T. Henricks, Mission Specialists Mario Runco, Jr., James S. Voss, F. Story Musgrave and Thomas J. Hennen. The primary payload, the Upper Atmosphere Research Satellite (UARS), was deployed on the third day of the mission. During its planned 18-month mission, the 14,500-pound observatory will make the most extensive study ever conducted of the Earth's troposphere, the upper level of the planet's envelope of life sustaining gases which also include the protective ozone layer. UARS has ten sensing and measuring devices: Cryogenic Limb Array Etalon Spectrometer (CLAES); Improved Stratospheric and Mesospheric Sounder (ISAMS); Microwave Limb Sounder (MLS); Halogen Occultation Experiment (HALOE); High Resolution Doppler Imager (HRDI); Wind Imaging Interferometer (WlNDII); Solar Ultraviolet Spectral Irradiance Monitor (SUSIM); Solar/Stellar Irradiance Comparison Experiment (SOLSTICE); Particle Environment Monitor (PEM) and Active Cavity Radiometer Irradiance Monitor (ACRIM II). Crew consisted of Commander John O. Creighton, Pilot Kenneth S. Reightler, Jr., Mission Specialists Mark N. Brown, Charles D. Gemar and James F. Buchli. The primary payload, Tracking and Data Relay Satellite-5 (TDRS-5) was attached to an inertial Upper Stage (IUS), and deployed about six hours into flight, the IUS propelled the satellite into geosynchronous orbit; TDRS-5 becomes the fourth member of the orbiting TDRS cluster. Secondary payloads were Space Station Heat Pipe Advanced Radiator Element II (SHARE II); Shuttle Solar Backscatter Ultra-Violet (SSBUV) instrument; Tank Pressure Control Equipment (TPCE) and Optical Communications Through Windows (OCTW). Other experiments included Auroral Photography Experiment (APE-B) Protein Crystal Growth Ill (PCG Ill); Bioserve / Instrumentation Technology Associates Materials Dispersion Apparatus (BIMDA); Investigations Into Polymer Membrane Processing (IPMP); Space Acceleration Measurement System (SAMS); Solid Surface Combustion Experiment (SSCE); Ultraviolet Plume imager (UVPI); and the Air Force Maui Optical Site (AMOS) experiment. Crew consisted of Commander John E. Blaha, Pilot Michael E. Baker, Mission Specialists Shannon W. Lucid, James C. Adamson and G. David Low. The fifth dedicated Spacelab mission, Spacelab Life Sciences-1, and first mission dedicated solely to life sciences, using the habitable module. The mission featured the most detailed and interrelated physiological measurements in space since 1973-1974 Skylab missions. Subjects were humans, 30 rodents and thousands of tiny jellyfish. Primarily the SLS-1 experiments studied six body systems; of 18 investigations, ten involved humans, seven involved rodents, and one used jellyfish. The six body systems investigated were cardiovascular/cardiopulmonary (heart, lungs and blood vessels); renal/endocrine (kidneys and hormone-secreting organs and glands); blood (blood plasma); immune system (white blood cells); musculoskeletal (muscles and bones); and neurovestibular (brains and nerves, eyes and inner ear). Other payloads included twelve Get Away Special (GAS) canisters installed on the GAS bridge in the cargo bay for experiments in materials science, plant biology and cosmic radiation; Middeck Zero-Gravity Dynamics Experiment (MODE); and seven Orbiter Experiments (OEX). Crew consisted of Commander Bryan D. O'Connor, Pilot Sidney M. Gutierrez, Mission Specialists James P. Bagian, Tamara E. Jernigan, M. Rhea Seddon, F. Drew Gaffney and Millie Hughes-Fulford. Dedicated Department of Defense mission. An unclassified payload included Air Force Program-675 (AFP675); Infrared Background Signature Survey (IBSS) with Critical Ionization Velocity (CIV), Chemical Release Observation (CRO) and Shuttle Pallet Satellite-II (SPAS-II) experiments; and Space Test Payload-1 (STP-1). Classified payload consisted of Multi-Purpose Release Canister (MPEC). Also on board was Radiation Monitoring Equipment III (RME III) and Cloud Logic to Optimize Use of Defense Systems-IA (CLOUDS-I). Crew consisted of Commander Michael L. Coats, Pilot L. Blaine Hammond, Mission Specialists Guion S. Bluford Jr., Gregory J. Harbaugh, Richard J. Hieb, Donald R. McMonagle and Charles L. Veach. The primary payload, Gamma Ray Observatory (GRO), was deployed on flight day three. The GRO high-gain antenna failed to deploy on command; it was finally freed and manually deployed by Ross and Apt during an unscheduled contingency space walk, the first since April 1985. The following day, two astronauts performed the first scheduled space walk since November 1985 to test means for astronauts to move themselves and equipment about while maintaining planned Space Station Freedom. The GRO science instruments were Burst and Transient Source Experiment (BATSE), Imaging Compton Telescope (COMPTEL), Energetic Gamma Ray Experiment Telescope (EGRET) and Oriented Scintillation Spectrometer Experiment (OSSEE). Secondary payloads included Crew and Equipment Translation Aids (CETA), which involved scheduled six-hour space walk by astronauts Ross and Apt (see above); Ascent Particle Monitor (APM); Shuttle Amateur Radio Experiment II (SAREX II); Protein Crystal Growth (PCG); Bioserve/instrumentation Technology Associates Materials Dispersion Apparatus (BIMDA); Radiation Monitoring Equipment III (RME Ill); and Air Force Maui Optical Site (AMOS) experiment. Crew consisted of Commander Steven R. Nagel, Pilot Kenneth D. Cameron, Mission Specialists Jerry L. Ross, Jay Apt and Linda M. Godwin. The primary objectives were round-the-clock observations of celestial sphere in ultraviolet and x-ray astronomy with ASTRO-1 observatory consisting of four telescopes: Hopkins Ultraviolet Telescope (HUT); Wisconsin Ultraviolet Photo-Polarimeter Experiment (WUPPE); Ultraviolet Imaging Telescope (UIT); and Broad Band X-Ray Telescope (BBXRT). Ultraviolet telescopes mounted on Spacelab elements in cargo bay were to be operated in shifts by flight crew. Loss of both data display units (used for pointing telescopes and operating experiments) during mission impacted crew-aiming procedures and forced ground teams at Marshall Space Flight Center to aim ultraviolet telescopes with fine-tuning by flight crew. BBXRT, also mounted in cargo bay, was directed from outset by ground-based operators at Goddard Space Flight Center and not affected. Other experiments: Shuttle Amateur Radio Experiment-2 (SAREX-2); ground-based experiment to calibrate electro-optical sensors at Air Force Maui Optical Site (AMOS) in Hawaii; and crew conducted Space Classroom Program: Assignment: The Stars, to spark student interest in science, math and technology. Crew experienced trouble dumping waste water due to clogged drain, but managed using spare containers. Mission cut short one day due to impending bad weather at primary landing site, Edwards Air Force Base, CA. Science teams at Marshall and Goddard Space Flight Centers estimated 70 percent of planned science data achieved. Crew consisted of Commander Vance D. Brand, Pilot Guy S. Gardner, Mission Specialists Jeffrey A. Hoffman, John M. Lounge, Robert A. Parker and Payload Specialists Samuel T. Durrance and Ronald A. Parise. Seventh mission dedicated to Department of Defense. Crew consisted of Commander Richard O. Covey, Pilot Frank L. Culbertson Jr., Mission Specialists Robert C. Springer, Carl J. Meade and Charles D. Gemar. The primary payload, ESA-built Ulysses spacecraft to explore polar regions of Sun, deployed. Two upper stages, Inertial Upper Stage (IUS) and a mission-specific Payload Assist Module-S (PAM-S), combined together for first time to send Ulysses toward out-of-ecliptic trajectory. Other payloads and experiments: Shuttle Solar Backscatter Ultraviolet (SSBUV) experiment; INTELSAT Solar Array Coupon (ISAC); Chromosome and Plant Cell Division Experiment (CHROMEX); Voice Command System (VCS); Solid Surface Combustion Experiment (SSCE), Investigations into Polymer Membrane Processing (IPMP); Physiological Systems Experiment (PSE); Radiation Monitoring Experiment III (RME III); Shuttle Student Involvement Program (SSIP) and Air Force Maui Optical Site (AMOS) experiment. Crew consisted of Commander Richard N. Richards, Pilot Robert D. Cabana, Mission Specialists William M. Shepherd, Bruce E. Melnick and Thomas D. Akers. Crew consisted of Commander Loren J. Shriver, Pilot Charles F. Bolden, Jr., Mission Specialists Steven A. Hawley, Bruce McCandless II and Kathryn D. Sullivan. Sixth mission dedicated to the Department of Defense. Crew consisted of Commander John O. Creighton, Pilot John H. Casper, Mission Specialists Richard M. Mullane, David C. Hilmers and Pierre J. Thuot. Objectives were deployment of SYNCOM IV-F5 defense communications satellite and retrieval of NASA's Long Duration Exposure Facility (LDEF). SYNCOM IV-F5 (also known as LEASAT 5) deployed first, and third stage Minuteman solid perigee kick motor propelled the satellite to geosynchronous orbit. LDEF was retrieved on flight day four using the remote manipulator system. Middeck payloads: Characterization of Neurospora Circadian Rhythms (CNCR); Protein Crystal Growth (PCG); Fluid Experiment Apparatus (FEA); American Flight Echocardiograph (AFE); Latitude /Longitude Locator (L3); Mesoscale Lightning Experiment (MLE); IMAX camera; and Air Force Maui Optical Site (AMOS) experiment. Crew consisted of Commander Daniel C. Brandenstein, Pilot James D. Wetherbee, Mission Specialists Bonnie J. Dunbar, G. David Low and Marsha S. Ivins. Fifth mission dedicated to the Department of Defense. Crew consisted of Commander Frederick D. Gregory, Pilot John E. Blaha, Mission Specialists F. Story Musgrave, Manley L. Carter, Jr. and Kathryn C. Thornton. The primary payload, Galileo/Jupiter spacecraft and attached Inertial Upper Stage (IUS), was deployed six hours, 30 minutes into the flight. IUS stages fired, placing Galileo on trajectory for six-year trip to Jupiter via gravitational boosts from Venus and Earth and possible observational brushes with asteroids Gaspra and Ida. Secondary payloads included Shuttle Solar Backscatter Ultraviolet (SSBUV) experiment carried in cargo bay, and in crew cabin, Growth Hormone Crystal Distribution (GHCD); Polymer Morphology (PM), Sensor Technology Experiment (STEX); Mesoscale Lightning Experiment (MLE); IMAX camera; Shuttle Student Involvement Program (SSIP) experiment that investigated ice crystal formation in zero gravity; and ground-based Air Force Maui Optical Site (AMOS) experiment. Crew consisted of Commander Donald E. Williams, Pilot Michael J. McCulley, Mission Specialists Franklin R. Chang-Diaz, Shannon W. Lucid and Ellen S. Baker. Fourth mission dedicated to the Department of Defense, and first flight of Columbia since Mission 61-C. Crew consisted of Commander Brewster H. Shaw Jr., Pilot Richard N. Richards, Mission Specialists James C. Adamson, David C. Leestma and Mark N. Brown. The primary payload, a Magellan/Venus radar mapper spacecraft and attached Inertial Upper Stage (IUS), was deployed six hours, 14 minutes into flight. The IUS first and second stage fired as planned, boosting the Magellan spacecraft on a proper trajectory for a 15-month journey to Venus. Secondary payloads were: Mesoscale Lightning Experiment (MLE), microgravity research with Fluids Experiment Apparatus (FEA), and Air Force Maui Optical Site (AMOS) experiment. One of five General Purpose Computers (GPC) failed and had to be replaced with a sixth onboard hardware spare. This is the first time a GPC was switched on orbit. Crew consisted of Commander David M. Walker, Pilot Ronald J. Grabe, Mission Specialists Norman E. Thagard, Mary L. Cleave and Mark C. Lee. The primary payload, Tracking and Data Relay Satellite-4 (TDRS-4) which was attached to an Inertial Upper Stage (IUS), became the third TDRS to be deployed. After deployment, the IUS propelled the satellite to a geosynchronous orbit. Secondary payloads: Orbiter Experiments Autonomous Supporting Instrumentation System-1 (OASIS-1); Space Station Heat Pipe Advanced Radiator Experiment (SHARE); Protein Crystal Growth (PCG); Chromosomes and Plant Cell Division (CHROMEX); two Shuttle Student Involvement Program (SSIP) experiments; and Air Force experiment using orbiter as calibration target for ground-based experiment for Air Force Maui Optical Site (AMOS) in Hawaii. Crew also photographed Earth with a hand-held IMAX camera. Crew consisted of Commander Michael L. Coats, Pilot John E. Blaha, Mission Specialists James P. Bagian, James F. Buchli and Robert C. Springer.